Villa Le Mas lies in a secluded valley in the Plaine des Maures,and has stunning views as far as the Alpes Maritime. 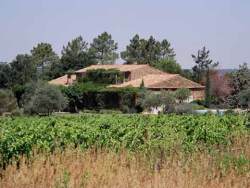 Beyond the vines there are extensive woodlands, home of the "Tortes des Maures'', the protected little tortoises. Villa Le Mas is the perfect setting for a relaxed secluded holiday. With excellent walks and views, whether you are looking for an idyllic retreat to write or paint, or to spend your holiday with friends and family, the informal atmosphere of Le Mas is unforgettable. Upstairs the two master bedrooms have their own private terrace, with stunning uninterrupted views over the valley, breath-taking first thing in the morning. The large downstairs bedroom has French windows leading directly to the swimming pool.